The first post that I published in 2014 was a write up about our lunch at Marcus Wareing at The Berkeley, so it's fitting that I start 2015 with a write up of another fantastic restaurant visit. Between Christmas and New Year myself and Nicola normally go to London for a few days to take in the festive mood of the capital whilst grabbing the chance to enjoy some fine dining and drinks. This year however, the West Coast Mainline was closed for three days for essential maintenance which made getting to the Big Smoke that little bit more difficult so we decided to spend a few nights in Edinburgh instead. We actually split our hotel accommodation and spend a night at the wonderful Hotel Du Vin, where we also had a very nice dinner, before moving to The George Hotel for our second night. We deliberately chose a hotel in the New Town for our second night because we still had every intention of enjoying a fine dining experience and there are no shortages of places within a short walk of George Street that we could do that. Edinburgh is no stranger to fine dining with Castle Terrace, Number One @ Balmoral Hotel, The Kitchin, Restaurant Martin Wishart, and 21212 all boasting Michelin stars. In addition to these highly regarded restaurants, there are a number of chefs at other establishments who are wowing diners with food that can't be far from being recognised by the Michelin inspectors. 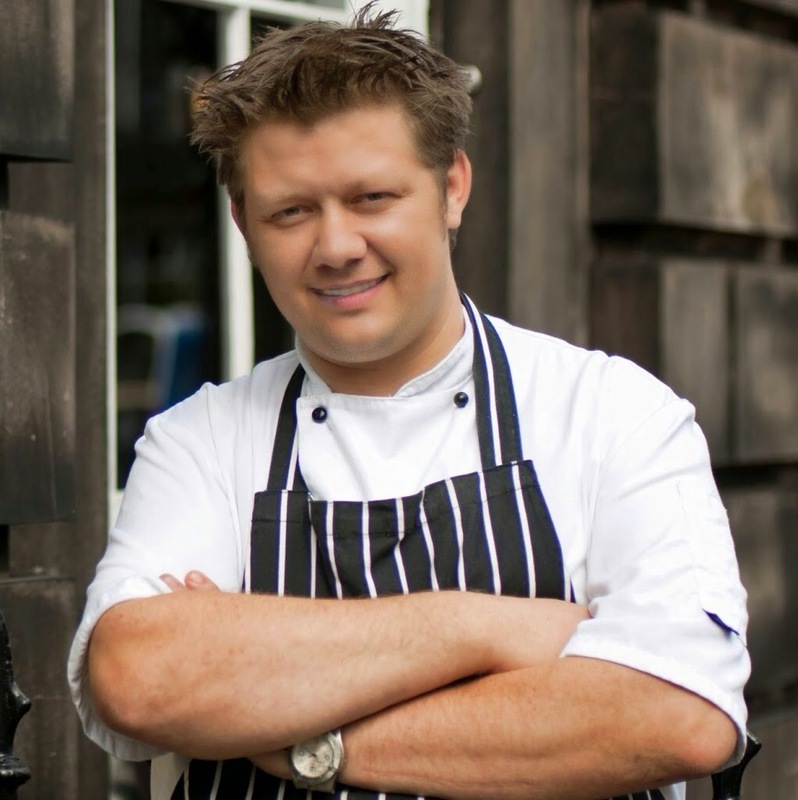 Earlier in the year Edinburgh chef, Mark Greenaway, had taken time out to answer 5 Questions for Gerry's Kitchen. As we were in his part of the city, we decided that it was only right that we should pop in and say hello. Of course whilst there, it would be rude not to stay for dinner at Restaurant Mark Greenaway. So that's what we did! 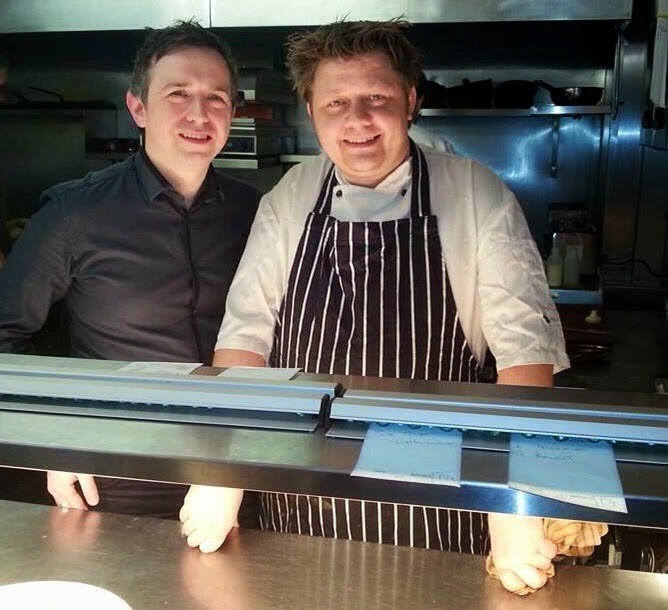 Restaurant Mark Greenaway is just a short walk from Edinburgh's main shopping thoroughfare of Princes Street and a five minute taxi ride from our hotel at the far end of George Street. When we arrived we were greeted and seated very efficiently before being offered a complimentary glass of champagne. A festive menu was being served through December up until Christmas Eve so when we arrived for dinner we would be ordering from the a la carte menu. 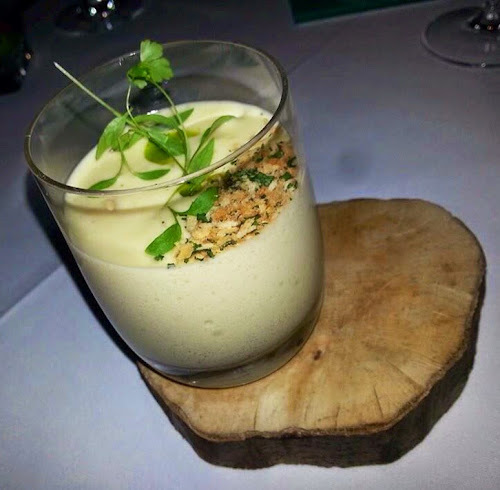 Our evening was kicked of with an appetiser of Lentil Espuma with micro herbs and toasted nuts. Espuma is the Spanish word for foam or froth and is the descriptive word for a technique developed by Ferran Adrià. The appetizer was light and airy but rich with an earthy lentil flavour. The micro herbs and nuts added just the right amount of texture to get our taste buds and minds ready in anticipation for the main event. The appetizer was a great opening gambit and it wasn't long before our meal started in earnest. For starter, Nicola had ordered a dish that has become Mark Greenaway's signature dish - Loch Fyne Crab 'Cannelloni', smoked cauliflower custard, lemon pearls, herb butter & baby coriander. 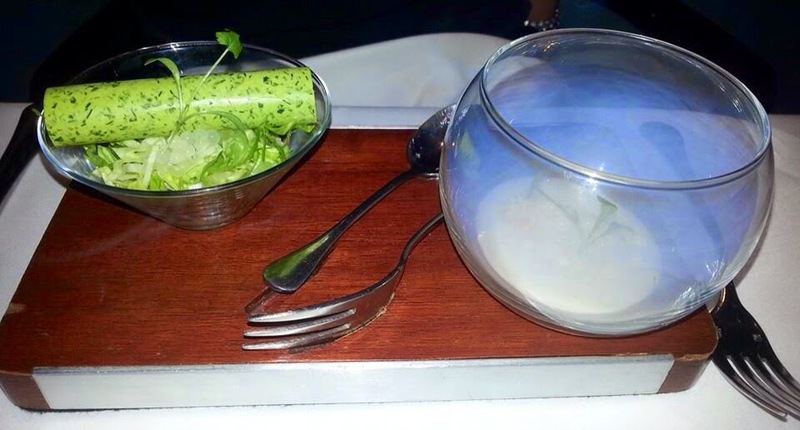 This dish first appeared when Mark threw his hat in the ring in the Scottish heat of Great British Menu. The dish is a beautiful piece of creative pairing with sweet crab and the slightly sweet cauliflower balanced by the sharp lemon and herb flavours whilst the drama of the smoke isn't just for show - the smoke helps pull all of the flavours together to create an almost perfect dish. 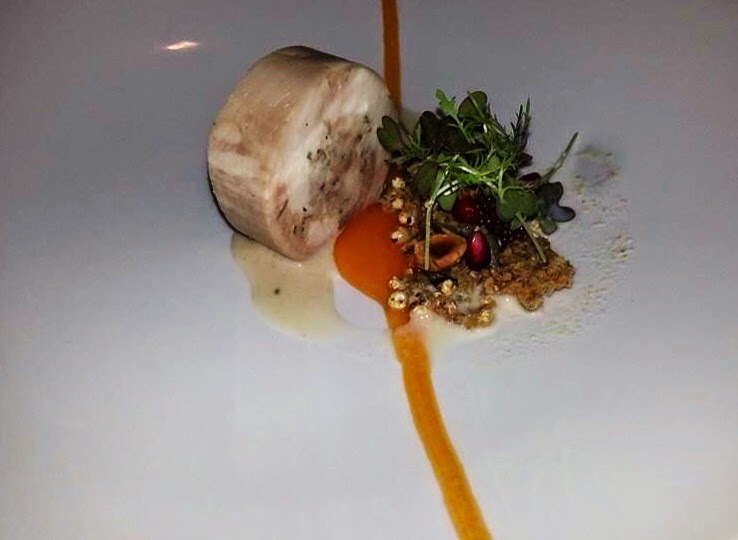 For my own starter I opted for the Rabbit Ballotine, savoury granola, pomegranate, wild flowers and hazelnut milk. I love rabbit and wish that I could eat more of it. I also love the fact that I've never had rabbit cooked the same way twice. My rabbit ballotine had a subtle gamey flavour which was complimented in taste and texture by the sweet pomegranate and nutty milky sauce. When rabbit tastes this good, I can understand why Elmer Fudd spent so long trying to catch that "pesky wabbit"! 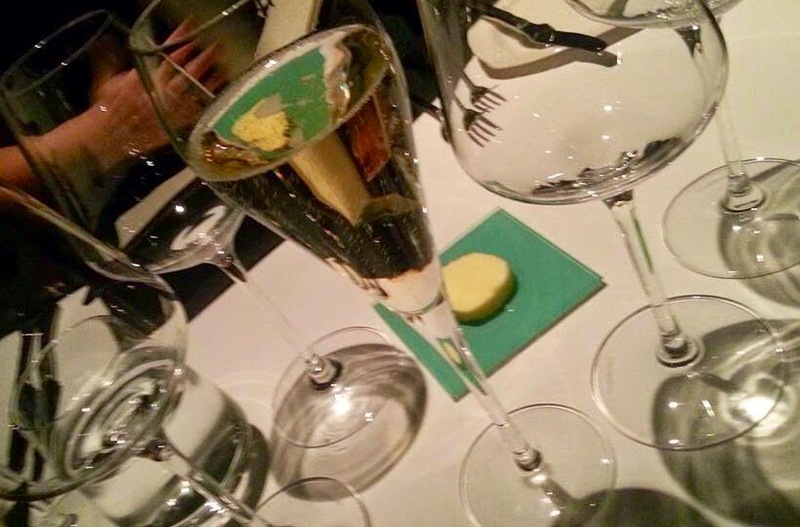 The wine list at Restaurant Mark Greenaway is an extensive array from across the globe. 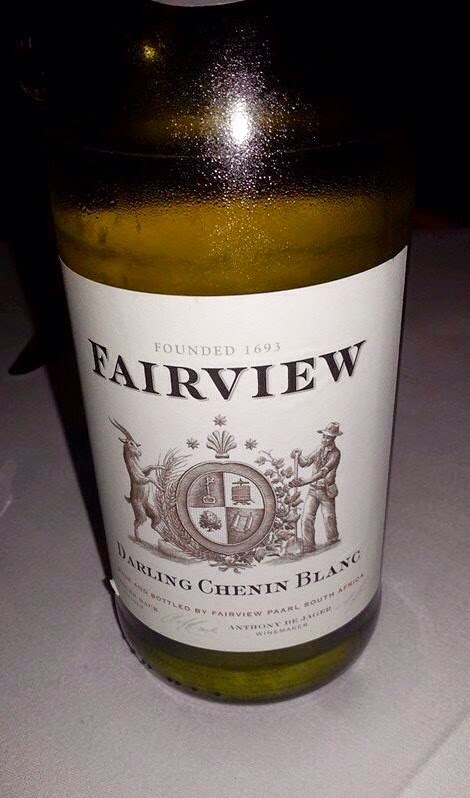 In the end we selected a very nice bottle of Fairview Darling Chenin Blanc which was a perfect accompaniment to the mains that we were about to be served. Tasty starters finished, we were both looking forward to the arrival of our mains and after a short interval we were each served our own personal works of art. 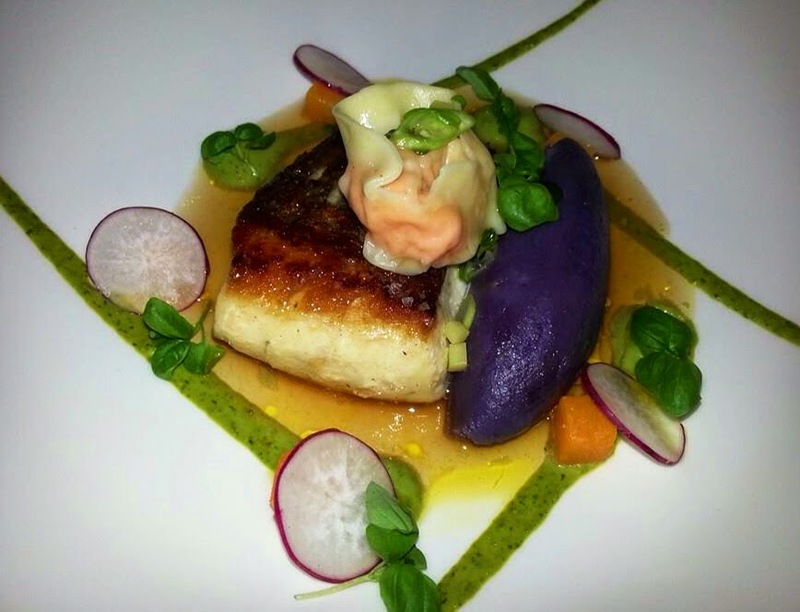 Nicola had ordered the Scottish fillet of Hake, lobster tortellini, fennel and dill purée, purple mash, butternut squash, radish, ginger and spring onion broth. This was a beautiful plate of food, bursting with colour, it was such a shame to set about it with knife and fork. The meaty hake fillet was cooked to perfection with each of the accompanying items having good reason to be there. The ginger and spring onion broth brought an almost oriental flavour to the dish and worked so well with the lobster tortellini. I struggled to choose as each of the main courses sounded fantastic. 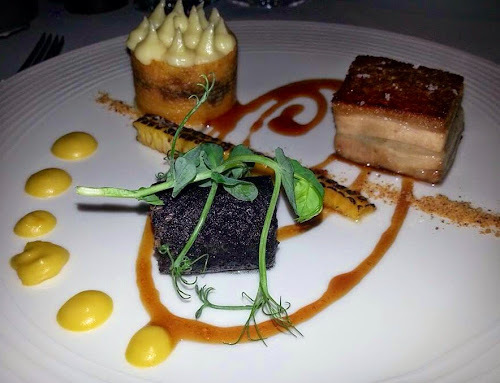 In the end I ordered the 11 Hour Slow Roasted Clash Farm Belly Pork, pork cheek 'pie', blackened fillet, sweetcorn, and toffee apple jus. All I can say is Wow! I was so impressed with this dish, in fact it may be they best plate of pork that I have ever been served. The pork belly was tender with a proper crackling top whilst the blackened fillet was a moist and juicy piece of tenderloin, but what topped of this dish was the clever little pie filled with pulled pork cheek and topped with creamy mashed potato. Instead of the usual side serving of apple sauce, my pork was set upon a wonderfully flavoured swirl of toffee apple jus, which coupled with the chargrilled corn off the cob rounded this dish of perfectly. We were both feeling pretty well fed so far and as we finished off our wine we were treated to a pre-dessert of burnt orange jelly, pannacotta wrapped in shortbread, and a red wine and chocolate sauce. This was like an adult version of a Jaffa Cake although it only worked properly if you had the right amount of each of the components on your spoon. It was the taste equivalent of 'rock, paper, scissors' and as I found out on most of of my spoonfuls - burnt orange beats pannacotta every time! That said, it did act as a very effective palate cleanser. After a decent break to allow our mains to settle, it was time for dessert. Nicola's choice of 'Knot' Chocolate Tart, custard jelly, frozen cookies, crème fraîche parfait, salted caramel & kumquat purée, was a chocolate lovers dream. This is another dish that Mark entered into The Great British Menu does Comic Relief and offered up a delicious rich deconstructed chocolate tart with a playful side. I'm happy to say that by this point, Nicola was beginning to feel a little full so I gallantly lifted up my spoon and helped her finish. 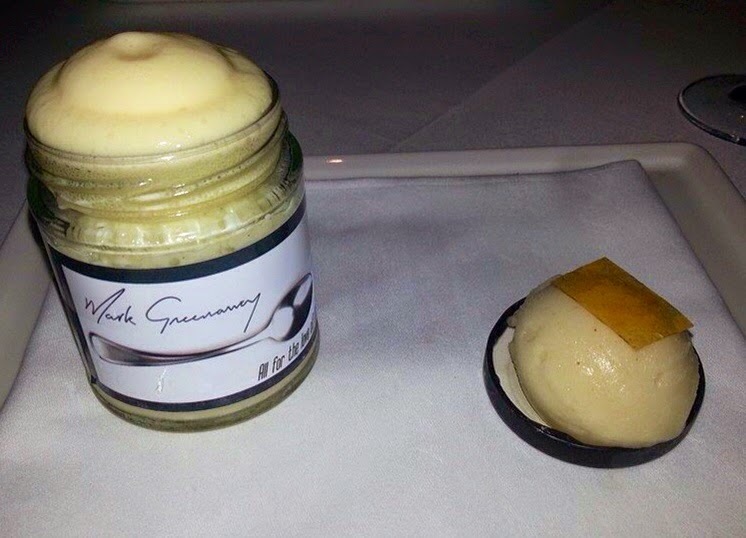 I had opted for the Jam Jar which turned out to be pear compote, sorbet, rice pudding & pear jelly. This was a fun way to end the meal with creamy sweet rice layered in the jar with a pear jelly and compote. The sorbet was served in the lid of the jam jar. I'm not usually a big fan of pears but I fancied the sound of the this dessert and wasn't disappointed. It looks like the Jam Jar might be a regular menu item as I notice that this month there is a raspberry version of the dessert available on the a la carte. After dinner we were shown into the compact kitchen where we had the chance to thank Mark and his staff for serving up a truly wonderful dinner, as well as thank Mark in person for answering 5 Questions back in May. 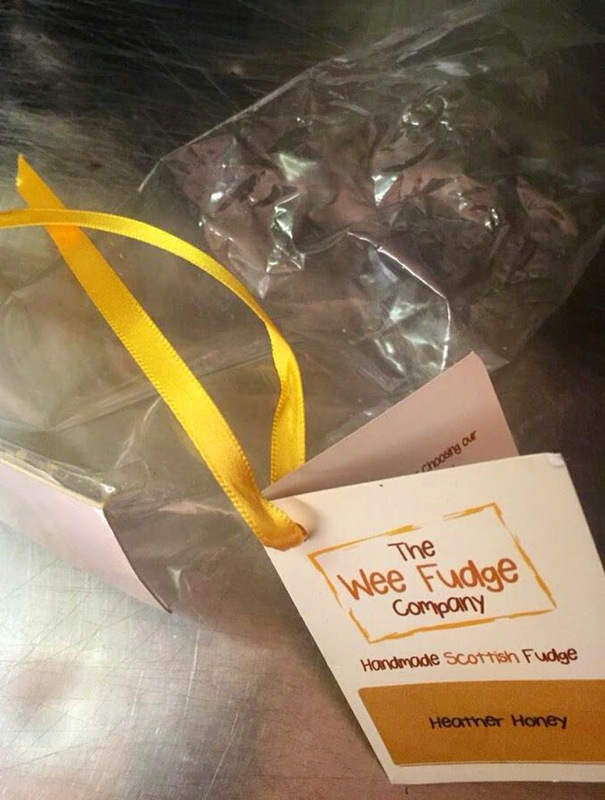 I follow Mark Greenaway on Twitter and know that he is a huge fan of The Wee Fudge Company so as it was Christmas, I took Mark a gift of the latest flavour sensation to come out of the kitchen of the fairy fudgemother, a bag of heather honey fudge made using honey supplied by Plan Bee. I think that my gift was well received as it certainly didn't last very long! 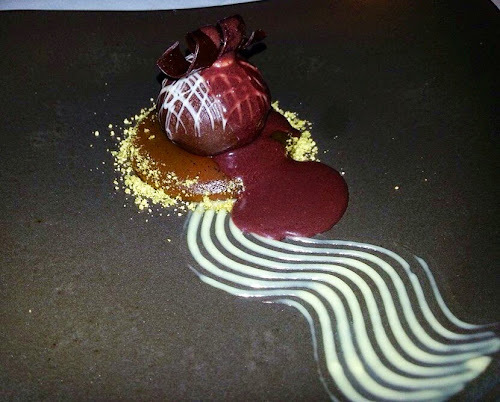 Our visit to Restaurant Mark Greenaway was thoroughly enjoyable with great service provided throughout and some well thought out dishes that should definitely give the Michelin inspectors something to think about in the coming months. We ate from the a la carte menu but if you get booking early, you can grab a bargain on the lunch menu with three courses available for just £22 which offers fantastic value. However for those diners looking for a treat, why not leave your dining experience in Mark's hands and try the eight course tasting menu at just £65? So to sum up - did we miss London this Christmas time? Yes. Did we miss out on a fine dining experience? Absolutely not! 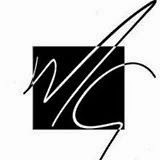 Keep up to date with Restaurant Mark Greenaway on Twitter and Facebook, or why not book yourself a treat by visiting the website?